PYONGYANG, North Korea (AP) — Ending his unexpected round of basketball diplomacy in North Korea on Friday, ex-NBA star Dennis Rodman called leader Kim Jong Un an "awesome guy" and said his father and grandfather were "great leaders" — an assessment that got short shrift from the U.S. government. 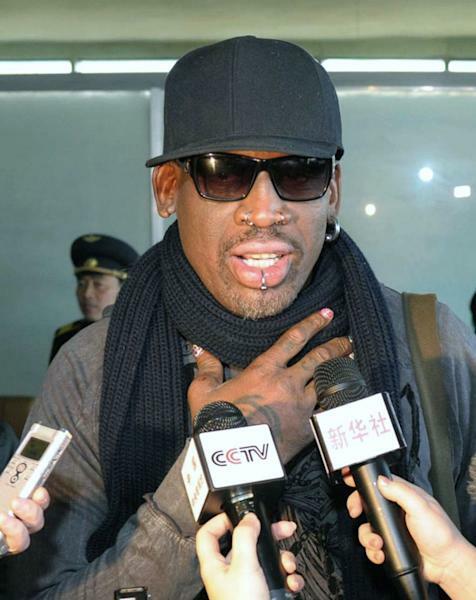 At Pyongyang's Sunan airport on his way to Beijing, Rodman said it was "amazing" that the North Koreans were "so honest." He added that Kim Jong Il and Kim Il Sung, North Korea's founder, "were great leaders." "He's proud, his country likes him — not like him, love him, love him," Rodman said of Kim Jong Un. "Guess what, I love him. The guy's really awesome." 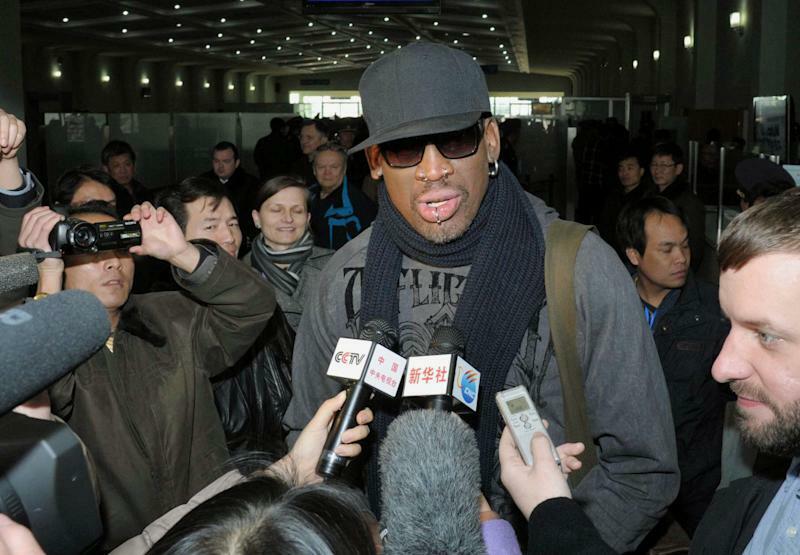 At Beijing's airport, Rodman pushed past waiting journalists without saying anything. Rodman's agent, Darren Prince, sent a text message to The Associated Press saying Rodman will be in New York on Sunday "to do some major press interviews and talk about his trip in North Korea as well as discussing what's accurate and inaccurate from the press the past few days." Rodman's visit to North Korea began Monday and took place amid tension between Washington and Pyongyang. North Korea conducted an underground nuclear test just two weeks ago, making clear the provocative act was a warning to the United States to drop what it considers a "hostile" policy toward the North. The State Department on Friday distanced itself from Rodman's visit and his praise for Kim, saying he doesn't represent the United States. "The North Korean regime has a horrific human rights record, quite possibly the worst human rights situation in the world," spokesman Patrick Ventrell told reporters in Washington. He accused the regime of depriving their people of food, shelter, water and maintaining prison gulags. 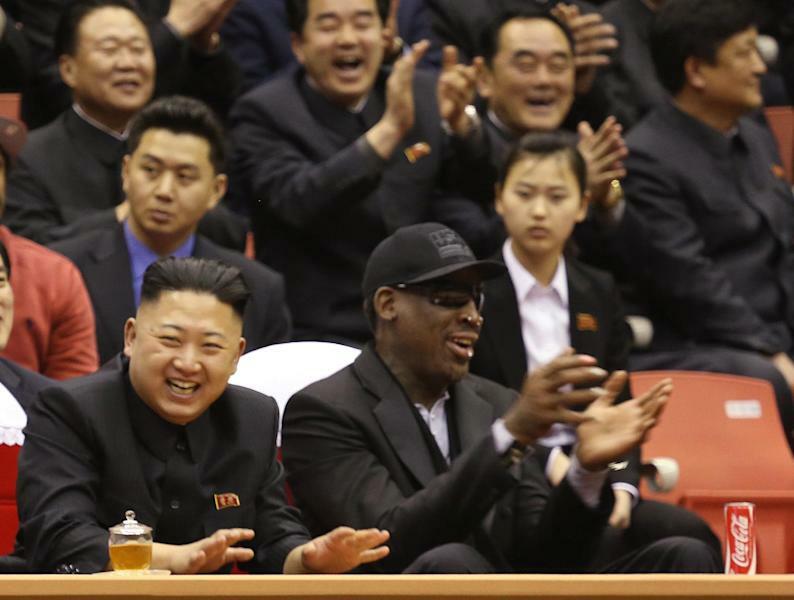 Ventrell also took aim at Pyongyang for its grand treatment of the visiting basketball stars. "Clearly you've got the regime spending money to wine and dine foreign visitors, when they should be feeding their own people," he said. Rodman traveled to Pyongyang with three members of the professional Harlem Globetrotters basketball team, Ryan Duffy, a correspondent with the New York-based VICE media company, and a production crew to shoot an episode on North Korea for a new weekly HBO series. Kim, a diehard basketball fan, told the former Detroit Pistons and Chicago Bulls star that he hoped the visit would break the ice between the United States and North Korea, said Shane Smith, founder of VICE, which calls itself a global youth media company. Dressed in a blue Mao suit, Kim laughed and slapped his hands on a table during the game at Jong Ju Yong Gymnasium as he sat nearly knee to knee with Rodman. Rodman, the man who once turned up in a wedding dress to promote his autobiography, wore a dark suit and dark sunglasses, but still had on his nose rings and other piercings. A can of Coca-Cola sat on the table before him in photos shared with AP by VICE. Smith, after speaking to the VICE crew in Pyongyang, said Kim and Rodman "bonded" and chatted in English, though Kim primarily spoke in Korean through a translator. Thursday's game ended in a 110-110 tie, with two Americans playing on each team alongside North Koreans. After the game, Rodman addressed Kim in a speech before a crowd of tens of thousands of North Koreans and told him, "You have a friend for life," VICE spokesman Alex Detrick told AP. At an "epic feast" later, the leader plied the group with food and drinks and round after round of toasts were made, Duffy said in an email to AP. Kim said he hoped sports exchanges would promote "mutual understanding between the people of the two countries," the official Korean Central News Agency said. Ventrell said the U.S. wanted North Korea to come into line with their international obligations and to stop ballistic missile tests and their nuclear programs. "We're not going to read into this sort of theater one way or another," he said. Rodman's trip is the second attention-grabbing American visit this year to North Korea. Google's executive chairman, Eric Schmidt, made a four-day trip in January to Pyongyang, but did not meet the North Korean leader. The Obama administration had frowned on the trip by Schmidt, who was accompanied by former New Mexico Gov. Bill Richardson, but has avoided criticizing Rodman's outing, saying it's about sports. Associated Press writers Matthew Pennington in Washington and Brian Mahoney in New York contributed to this report.